1.Beat eggs, sugar, salt, milk and vanilla in a shallow dish. 2.Soak bread in the above mixture. 3.Heat butter over medium high heat in a pan. 4.Bake each slice of bread in the pan until it turns slightly brown on each side. 5.Serve with brandied lemon butter and lemon slices. 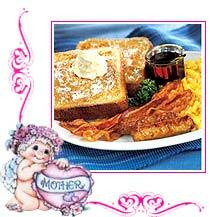 6.Sprinkle with powdered sugar, if desired and your french toast is ready to be served. 1.Melt butter over low heat. 2.Pour the melted butter into a dish. 3.Wash pan and pour butter back in the pan and add the sugar. 4.Stir constantly until sugar dissolves. 5.Add lemon juice, rind, and brandy; stir until smooth. 6.Pour over hot French toast and serve.